The illustration at the head of this page and many others on this site is taken from William Kennish’s 1837 book “ A Method of Concentrating a Broadside...” and is described by William below. 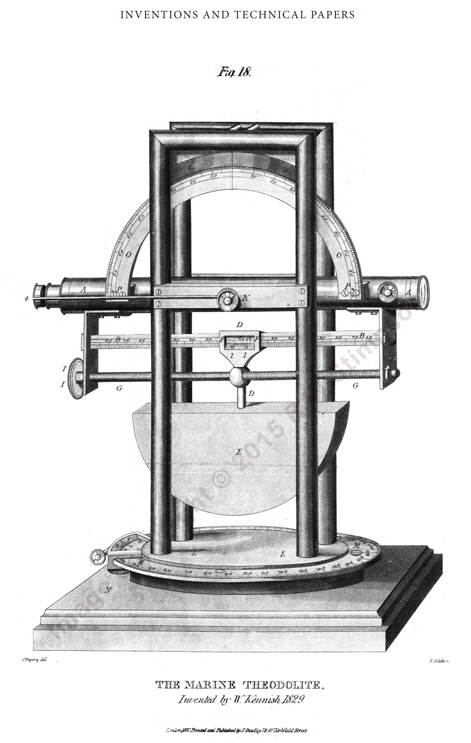 The image of his Marine Theodolite directly below is taken from his medal-winning Society of Arts Manufactures and Commerce paper published in 1832. The two Ships in the Frontispiece are supposed to be in chase. The headmost one, finding the stern ship within the distance (500 yards) of No. 5 Fire, shortens sail by taking in studding sails, clewing up the courses and royals, which help to bring the ship on an even keel and also to deaden her way ; the ship is then partially bought to the wind, sufficient to bring the line of sight of the instrument on the bow of the enemy in her water line, pointed out by the dotted lines from the poopdeck of the headmost ship to the water-line of the enemy. The small circle on the gunwale represents the Marine Theodolite, the height of which from the water is known, and by which the distance between the two ships is ascertained. Previous orders are given to the helmsman to reverse the helm. The moment the broadside is discharged, sail is again made, and the ship brought to her former course. The manoeuvre here represented is intended that the ship chased is of an inferior force such as a frigate, by which she may be enabled to extricate herself from falling into the hands of the enemy, should the latter be capable of overreaching her; and if the manoeuvre is well performed, there is no doubt of its success. The reason I have shown the ships of equal force is, that a three-decker shows my plan to greater advantage. 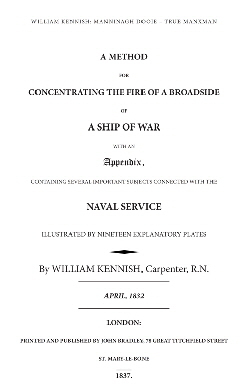 All of the text and illustrations from “Concentrating a Broadside...” are faithfully and accurately reproduced in the current book which brings these back into publication for the first time in 164 years. 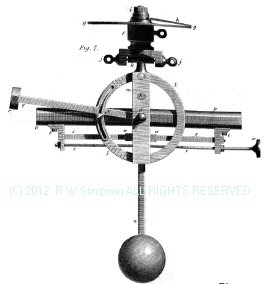 The figure below is the 1837 version of the 1828/32 theodolite - much refined from its earlier practical prototype.